Space Bar to Enter Boot Options | Its Madh !!! You are already familiar with the F8 key, which will redirect you into boot options in windows Xp as well as in Windows Vista. But now Pressing space bar after the bios options will redirect you into boot options in vista. It is same as hitting F8 button. But for Windows 7 users, you can use another key, F10 ! 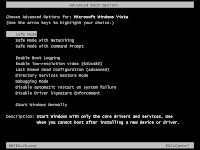 there is a special options called Startup recovery, which is available in the Windows Vista Installation DVD. This is very helpful to users to repair the system smoothly.